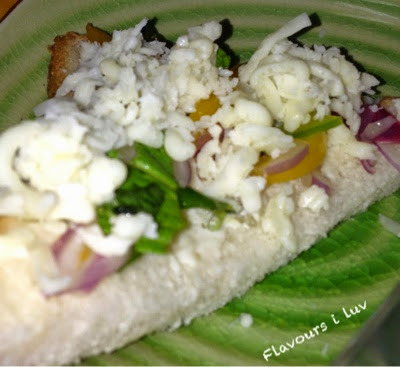 Crispy toast with bubbling cheese and hot chillies, it really tastes great !! Cut green chillies finely. Cut capsicum in thin stripes. Mix onion slices with green chillies, capsicum, coriander and mint leaves. Add salt and mix well. Cut the bread slices diagonally and apply butter on one side, place it in a oven dish as the buttered side down. 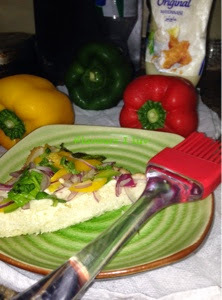 Sprinkle onion green chilli mixture on it and top with mozzarella cheese. 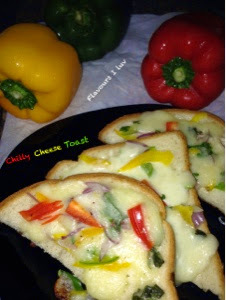 Preheat oven at 180 deg C for 10 mins and bake it at the same temperature for 3-5 mins until cheese melts completely. If making in stove top place the bread pieces on a nonstick pan and sprinkle onion chilli mixture on it and top with mozzarella cheese. Toast in low flame until cheese melts.